Inspired by a story the mother of the Quinn brothers overheard as a girl growing up in Ireland, This Is My Father marks the impressive filmmaking debut of writer/director Paul Quinn with this heartbreakingly moving and tender love story. Despite an overly long set-up featuring the always charismatic James Caan as burned out high school teacher Kieran Johnson, the film quickly finds its footing once Johnson along with his nephew depart present day Chicago and return to their ancestral Ireland to try and learn more about Kieran’s father whom he never knew after discovering an old picture and inscription in a book of poems in his ailing mother’s belongings. Once in Ireland, Kieran and his nephew meet up with fortune teller Moira Deady and her money-hungry son (Colm Meaney) who begin to tell the men the story of their free-spirited, rebellious mother Fiona back when she was a seventeen year old girl and fell in love with the elder Kieran O’Day an introverted orphaned famer played by the always effective Aidan Quinn. 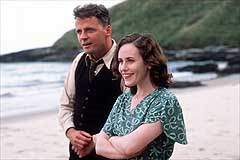 Beautiful and bold newcomer Moya Farrelly admirably holds her own opposite veteran Aidan Quinn in a difficult role as the lovers begin an awkward courtship that’s threatened by the overbearing and guilt inducing hellfire and brimstone sermons at the local Irish Catholic parish and Fiona’s bitter alcoholic mother, the Widow Flynn (Gina Moxley). In spite of the Widow’s efforts to prevent her independent daughter from continuing to frolic with Kieran, the two begin spending more time with one another and on a memorable trip to the city, find themselves surprised by the arrival of the man in the sky—John Cusack who brings a much needed air of joyful energy to the film as a Life Magazine photographer who lands on the beach and befriends them for an evening. Although we know that the love story will end tragically, this gorgeous and sweepingly old fashioned tale is made all the more memorable thanks to Declan Quinn’s gorgeous cinematography, who as he did in Monsoon Wedding, In America and Leaving Las Vegas reminds us once again that he’s one of the greats. While Paul Quinn was criticized for “barely mask[ing] his contempt for organized religion,” by Variety’s Leonard Klady who felt that This Is My Father “comes to the dark conclusion that there is no reward for decency,” I found the deeply heartfelt and personal movie to be a fitting one for its genre and time period, reminding me of a tragic Thomas Hardy or Charles Dickens novel. Quinn’s Canadian and Irish coproduction which premiered at the Seattle International Film Festival is one that shouldn’t be missed on DVD.